A.G. Bell is a unique private school, the only Montessori School in our nation mainstreaming deaf and hearing children through a little-known method called Cued Speech. At A.G. Bell, everyone excels, often surpassing everyone’s expectations. That’s why their slogan is, “Every day a miracle.” Miracles DO happen at A.G. Bell! My encounter with this school began about twenty years ago. I was donating my poetry writing services for my temple’s fundraiser. A lovely woman named Mary Ann Lachman chose my services, and asked me to write a poem for her son, Ben’s Bar-Mitzvah. Without hesitating, Mary Ann said, “I’m very proud of him. He is speaking in both English and Hebrew at his Bar-Mitzvah, and he’s totally deaf!” She paused, letting the shock value of her words sink into my mind. “What?” I asked incredulously. I never knew this feat could be possible. While everyone loved the poem I wrote for Ben’s Bar-Mitzvah, the real gift to me was being able to learn about A.G. Bell Montessori and the impact of Cued Speech. Cued Speech was invented in 1966 by Dr. R. Orin Cornett to address the poor literacy that he found among his deaf students. Students functioned at an average of a 3rd or 4th grade literacy. Why? Because while Sign Language is a perfect mode of communication for deaf to deaf conversation, it does not convey the same grammar, sentence structure or vocabulary as spoken language. Determined to improve literacy among his deaf students, Dr. Cornett created a system where all the phonemes of speech could be communicated visually. He wanted to clarify lip-reading, so sounds that look the same on the lips could be represented on the hand. Eight simple handshapes represented all consonants and four positions around the mouth represented all vowels. Cued Speech allowed students to speak or mouth the English words (or words from any language) and simultaneously use the hand shapes and positions to express themselves. Likewise, a hearing person could speak in their own native language, and use Cued Speech to mirror their exact words. Cued Speech was easy to learn. People could learn the basics in a few days or a week, compared to the years needed to master Sign Language. Mary Ann and her husband Ron quickly discovered how easy it was to learn Cued Speech, and found a teacher who was able to teach their son, Ben. Soon, Ben was learning to read, write and understand everything through Cued Speech…. just like his hearing peers. It was like a miracle! Even being able to freely communicate within the family was a great blessing. How could they best share this gift with others? It felt obvious they needed to start a school. Knowing about the excellent approach through the Montessori method, Mary Ann and Ron decided to use the Montessori framework. This approach encourages children to be independent thinkers. They also wanted to integrate both hearing and deaf children, so all children could learn to be friends together. 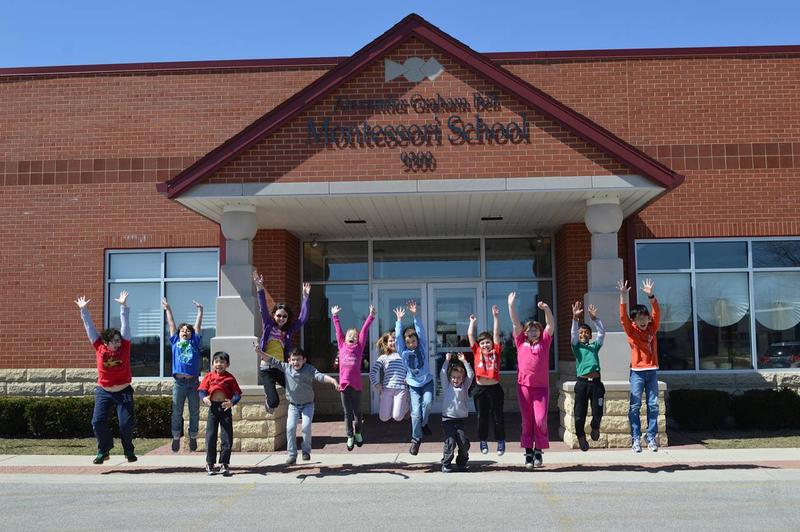 Alexander Graham Bell Montessori School was named after the famous inventor, Alexander Graham Bell, who pioneered the idea of capturing sound and recording it. Soon, other families heard about A.G. Bell Montessori and their Cued Speech program. When they saw the great leaps in learning for their children, they got excited. Some people even moved to Illinois from other states just to bring their children to this school! As time went on, I learned that some people in the deaf culture resented Cued Speech. It seemed Cued Speech was caught between two ways of thinking. That is slowly changing now, due to extensive proven research. Those who only advocate for Sign Language may feel that Cued Speech pushes them towards being oral. Besides that, these people feel that using Cued Speech requires them to abandon deaf culture. On the other hand, some cochlear implant surgeons feel that Cued Speech looks too much like Sign Language. They don’t take the time to understand its benefits. A.G. Bell, one little school, knew that Cued Speech could be valuable to both the Sign Language and cochlear implant groups. As their Board President, Sandy Mosetick later told me, “If your deaf child is going swimming or a room is very loud, you can’t rely on hearing aids or a cochlear implant.” She also wanted to use the same words to her daughter Rachel that she was speaking. Just like Ben, Rachel achieved high literacy and academic skills through Cued Speech. She later mastered Sign Language and had cochlear implant surgery. No matter how Rachel chose to communicate, she could always use Cued Speech whenever she needed to be understood or heard. This amazing school is like the train from “The Little Engine That Could.” They keep chugging away, overcoming challenges: the lack of awareness about Cued Speech, the biases still lingering in the deaf community, the inadequate funding support. Yet their unswerving commitment to help families with children, both deaf and hearing, continues making a difference to so many families. What’s their next goal? Making Cued Speech accessible to everyone across the world! Funding is needed to complete the Cue College website. The site will bring so many benefits to children, families and adults. Families with deaf children will have immediate access to learning how to easily communicate with their own child. Children with implants will benefit from Cued Speech too. It’s not always easy to hear someone in a crowded, noisy room, or when swimming, bathing or in a large space. Using Cued Speech makes all the difference. My hope is that ultimately, somewhere, someone will read this and think… “I know a child who can benefit from that school.” Special needs children also do amazingly well through Cued Speech. Or at the very least, someone might read this blog, and share its news to others who will experience a miracle by bringing their child to this school. My joy is telling positive stories like this to spread seeds of hope, inspiration and transformation. If you know someone who can benefit from knowing about this special school, please share this news with them. It could make all the difference in the world to that child and family. Even though sweet Mary Ann passed away too soon, her legacy lives on. I know she would thank you for keeping her school in your heart. We all make a difference in someone’s life. It’s just up to us to decide what kind of difference we want to make.